Construct files can be viewed either graphically or as a sequence. Up to now, we have been working with a graphical view of the construct, but underneath all of this is a real DNA sequence. Start GCK and open the file construct#3 that you saved in the previous tutorial. If you do not have this file, you can start with construct#3 from the tutorials folder provided. Choose Construct > General Info…. You will see something like Figure 2.14. The General Info is stored with the construct as a whole and is not attached to any specific segment or region of the DNA. This means that it will not be lost if you reformat the construct or cut and paste segments. It is a useful place to store information such as storage location for the DNA and other information as shown in construct#3 . In combination with the File Searching ability (Tutorial 8: Finding Comments and File Searching), the comments can be used to create a database of information on all your clones. Use the scroll bar until you see the information stating that the f1 DNA, which contains an origin of replication, is in the segment from 3-458. What we would like to do now is indicate the location of this particular segment of DNA, but how do we define the locations in our graphical construct which does not have any markers at those locations? The answer is to view the construct as a sequence rather than graphically. Close the General Info window and then choose Construct > Display > Display Sequence. This will bring up Figure 2.15. If your display does not look like this figure, then scroll the sequence all the way to the top of the window. Notice the correspondence between the graphical view and the sequence view. Colors are maintained, sites are marked, and regions are indicated. However, since we specified that the regions we marked are protein regions (Figure 2.13), the translated peptide is displayed below the actual DNA sequence. The small triangles adjacent to the amino acid line numbers indicate the direction of translation. Before we can mark the f1 origin of replication, we need to be able to identify the nucleotides to be marked. Let’s add position indicators by choosing Construct > Display > Show Positions. Remember how double-clicking on a segment in the graphical view of the construct selected that particular segment? This works the same way in the sequence view. So double-clicking anywhere in the DNA sequence will select that entire segment. Try this by double-clicking anywhere in the sequence to get a feel for how segments are defined. You will notice that segment boundaries can be site markers or changes in color or text characteristics. With the insertion point (mouse cursor) anywhere in the DNA sequence, choose Edit > Select All (command-A, Mac or ctrl-A, Windows). This will select all of the DNA sequence. Now choose Format > Grouping > Group by Tens. This will arrange the sequence to be displayed in groups of tens. Note that there is an option in the Format > Grouping menu to define your own group size. This can be useful, for example, if you are working with something like an octamer repeat. You can define a groups size of 8 to display this repeat easily. Grouping by ten is good for viewing the sequence and identifying specific locations, but does not look right for viewing those parts of the sequence that correspond to translated regions of the DNA. We need to group the translated regions into groups of three corresponding to the codons. This can be done in two ways. You could select the DNA corresponding to the peptide by clicking and dragging the mouse over the correct region of DNA. There is an easier way to do this, however, by just double-clicking on the amino acid sequence . This is a built-in feature of GCK to make it easier to select DNA segments that correspond to regions. Double-clicking on any region will select the corresponding segment of DNA. So double-click on the amino acid sequence corresponding to the beta-galactosidase gene (it ranges from 244-846). Now choose Format > Grouping > Group by Threes. We now need to indicate our origin of replication. Identifying origins of replication is something that you might like to do in all of your constructs and you would like an easy visual method of identifying those regions from amongst the many that you might end up marking. You can do this by defining a specific color to represent an origin of replication. Choose Format > Color > Add a Color…. You will see Figure 2.16. 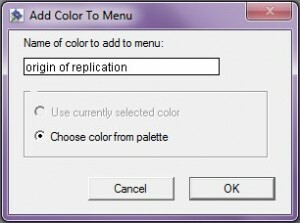 Type in “origin of replication” for the name of the color and then press OK. Choose a color from your computer’s standard Color Picker. Now you have defined a new color called origin of replication. This color should now appear in the Format > Color menu. The ability to define your own color and to name it provides an easy way for you to indicate features of interest such as promoters, enhancers, and other sites on DNA. If all your constructs are defined using your own “standard” colors, it will be easy to recognize specific functions of constructs just by observing the colors. Let’s take advantage of the new color we just created to identify the origin of replication for our construct. Use the mouse to select nucleotides 3 through 458. You can confirm that you have the correct nucleotides selected by looking in the lower left corner of the window. Choose Construct > Features > Make Region…. You will see the dialog shown in Figure 2.17. Make sure you type in the correct name and put any comments you have into the comments area. This is NOT a protein sequence so do not check the Protein sequence checkbox. Confirm that the first and last nucleotides are 3 and 458, respectively. Press OK. The newly created region will be selected so you can now alter its appearance. Choose Format > Lines and select the line having an arrowhead at both ends. This will change the region to have two arrowheads. With the region still selected, choose Format > Color > origin of replication to change the color of the region to indicate its function. You can also use the Format menu now to change the line thickness and arrowheads if you so desire. When you are done you should see something like Figure 2.18. You can now easily recognize the origin of replication by color and can use that region to select the corresponding DNA by double-clicking on the region. If working with a ‘Trial Version’ or the ‘Full Version’ of the application, choose File > Save As… , name the file myconstruct#4, and save it in your own folder – please do not replace the tutorial files provided because others might want to use them later. You will need this file in the next tutorial. That tutorial will explain how to enhance the appearance of your sequence in the construct window. You can quit now, or continue on to Tutorial 5: Modifying the Construct Appearance. If you plan on continuing, you can leave the file you just created, construct#4, open. If not, close this file. This entry was posted in gene construction kit tutorials and tagged Format DNA Sequence, Gene Construction Kit, Gene Construction Kit Tutorials, Tutorials. Bookmark the permalink. Post a comment or leave a trackback: Trackback URL.